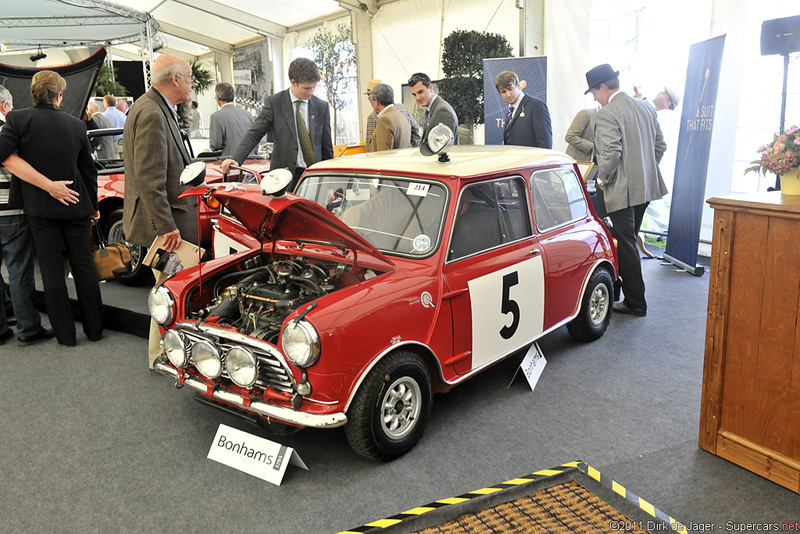 Right after making its first appearance, the Mini proved to be a genuine sports car in the true sense of the word. countless teams and private drivers recognised and acknowledged the great potential this small car had to offer with its driving behaviour reminiscent of a go-kart. 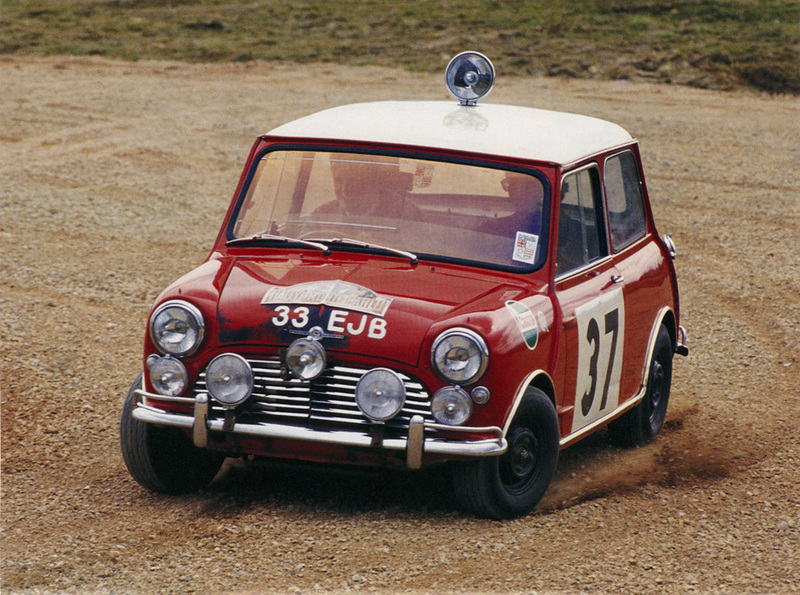 The most significant stronghold of this car was and always remained rally racing, the works Minis tuned by John Cooper, in their red livery, were becoming increasingly competitive with more power. 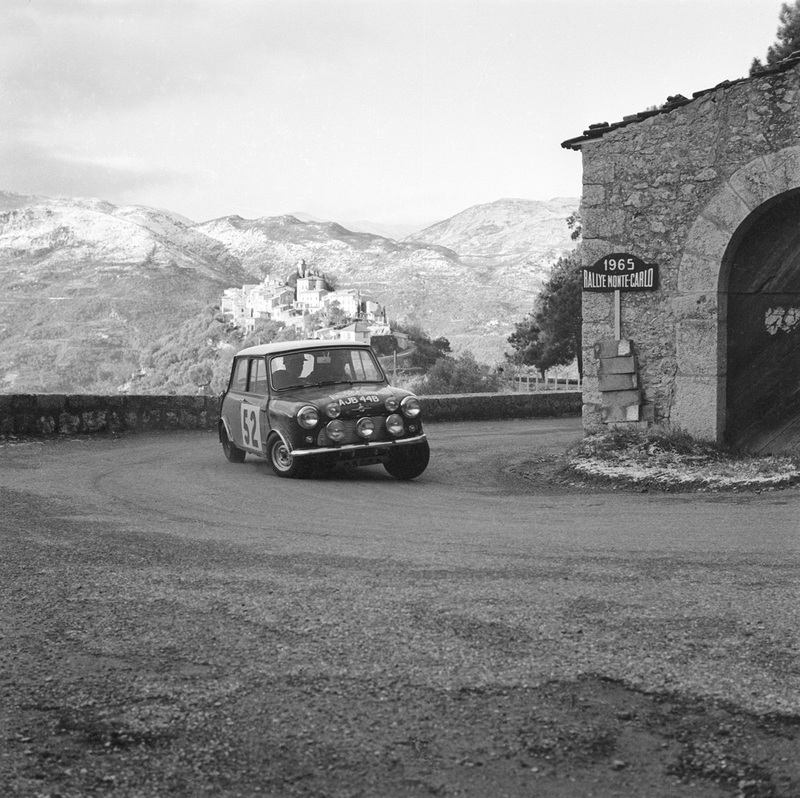 Starting in 1962 the Mini Cooper and, later, the Mini Cooper S brought home a number of international victories, scoring the first win in the Tulip Rally with Pat Moss, the sister of Stirling Moss, at the wheel. 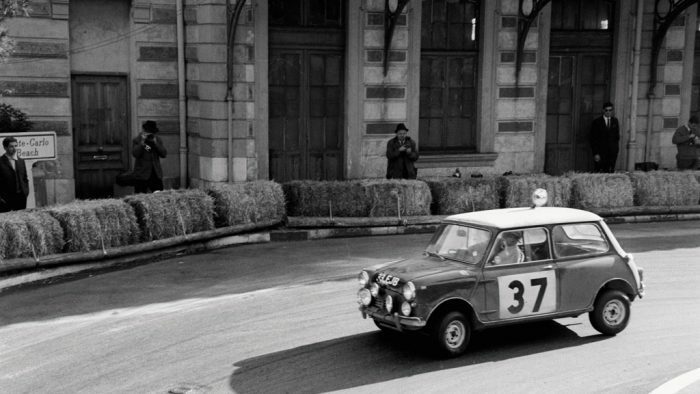 According to some sources, the Mini Cooper brought home no less than 153 racing wins in 1962 alone. 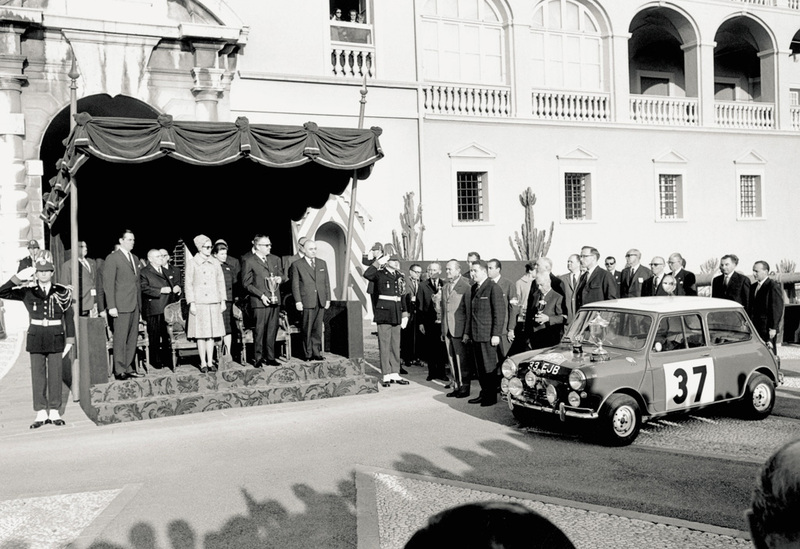 The Monte Carlo Rally promised to be more exciting than ever in 1964. And what had become increasingly evident in the years before then became a clear fact on 17 January 1964. The era of the amateurs was coming to an end, with more and more works teams now entering the Monte. The ultra-powerful Ford Falcons of Greder/Delalande and Schlesser/Leguezec were matched by the Mercedes-Benz 300 SE driven by Bohringer/Kaiser and Glemser/Braungart. But Trana/Lindstrom at the wheel of a Volvo 544 also expected to look good, just like Toivonen/Jarvi in their Volkswagen 1500. Citroen entered no less than four DS 19s, but in terms of sheer numbers everyone still lagged behind the BMC, registering an six nimble Minis, with 24 more Minis being raced by private teams. Mini drivers Patrick Hopkirk and Henry Liddon set out on the Monte with another Mini team: Rauno Aaltonen and Tony Ambrose. In 1963 Aaltonen and Hopkirk finished first and second in their class, the Flying Finn even clinching third place overall. And in 1964 they entered the race with a new and even more powerful car: the new Cooper S with a larger engine which displaced 1071 cc, developing maximum output of 70 bhp (52 kW). Not only the higher top speed of 99 mph (160 km/h) promised to make the Mini more competitive, but also, much faster acceleration to 60 mph (100 km/h) in 13 instead of 19 seconds. The Rally started out very well for the Mini drivers in their compact racing machines: The average speed of all cars on their 2485 mile (4 000 km) trip to Reims is 31 mph (50 kph). Only 277 cars reached this first destination, all the works Minis among them. 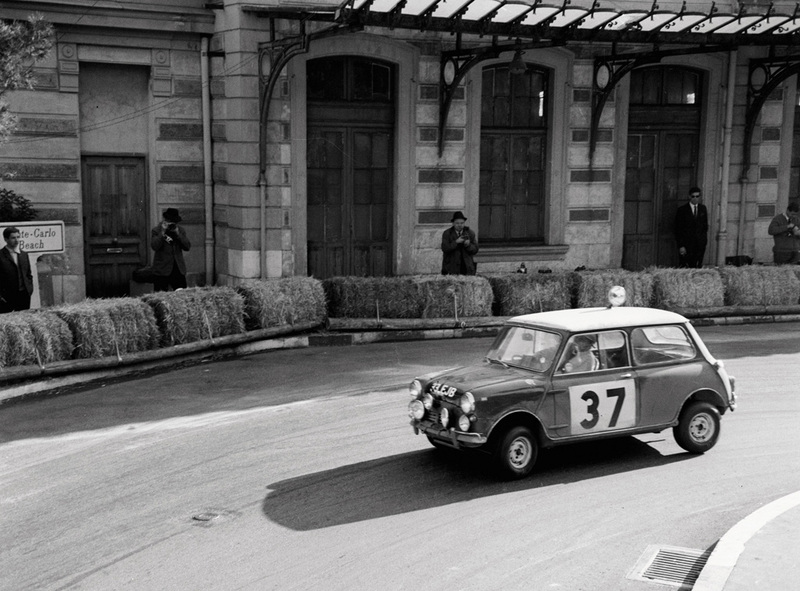 In this famous French city, the race officials carefully make a note of the number plates on the three red Minis with their white roofs destined to become legend: 33 EJB driven by Paddy Hopkirk, LBL 6D with Rauno Aaltonen at the wheel, and AJB 44B piloted by Timo Makinen. The first leg of the Rally finished all teams in Saint Claude, with a distance of 370 miles (597 km) . After the 14 mile (23 km) special trial between Saint Didier and Mont Main, the Ford Falcons with their 4.7-litre 8-cylinder power units appeared to confirm their leading role, Bo Ljungfeldt ranking first with Patrick Hopkirk only being 16 seconds behind in his Mini Cooper S.
The nimble Minis did not have a very good chance of keeping these leading positions, since they were not built for very high speeds. And the next leg of the race, from La Madelaine to Pelle Autiers, is a 29 mile (46 km) full throttle trial.The nature of this course was reflected by the ranking at the end of the day: Ljungfeldt remained in the lead with his Ford Falcon, Trana was now in second place in his humpback Volvo. 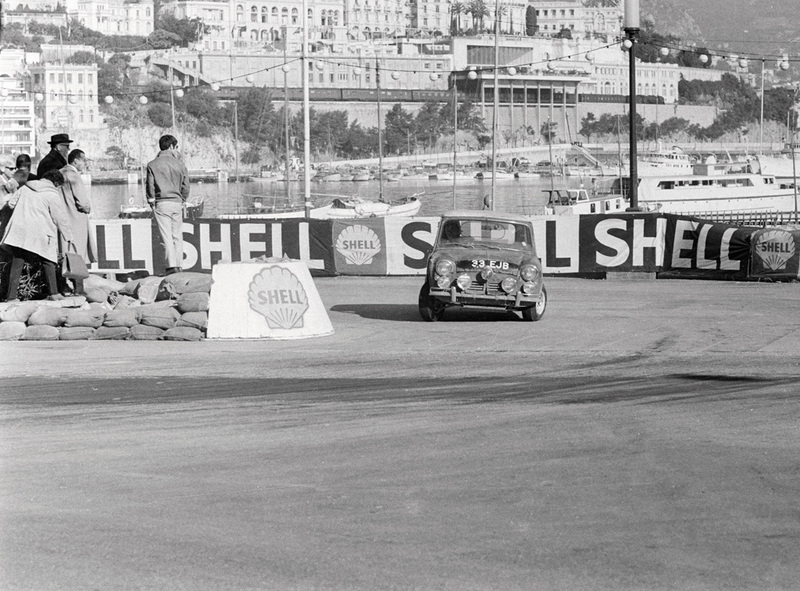 But the Minis put up a tremendous show all the same, Paddy Hopkirk dropping back only one place to third. Entering the next decisive and most demanding day, the teams use all their resources and special ploys to achieve the best possible result: Scouts drive the same icy route as late as possible prior to the start of the race in order to warn the drivers of critical spots. Prior to the night, Ljungfeldt’s Ford is 65 seconds ahead of the Minis. But, Ljungfeldt’s large engine was a disadvantage, since the rule in the Monte Carlo Rally stated that drivers with larger engines have to drive faster to avoid penalty points. Ljungfeldt hurled his car through the serpentines up to Col de Turini at an altitude of 5 271 feet (1 607 metres), but the weight of his Ford Falcon, the sheer size of the car and rear-wheel drive prove to be a disadvantage on deep snow. Thge Mini Coopers, in turn, compensated their lack of power through their nimble handling combined with front-wheel drive. Reaching the finish line at the end of the second leg, Ljungfeldt was only 17 seconds ahead of Hopkirk. And according to the handicap formula, the Irish driver was now in the lead in his Mini Cooper with 2,152.1 penalty points. Second was Saab driver Eric Carlsson with 2,183.2 points. Makinen has also moved up one place, 2,216 points putting him just 0.2 points ahead of Ljungfeldt. The only chance the Ford Falcon driver had for victory is to win the final circuit race on the Grand Prix city track in Monaco, included for the last time in the Monte Carlo Rally. Ljungfeldt pushed the Falcon round the circuit as fast as he can, with only Schlesser being able to keep up. 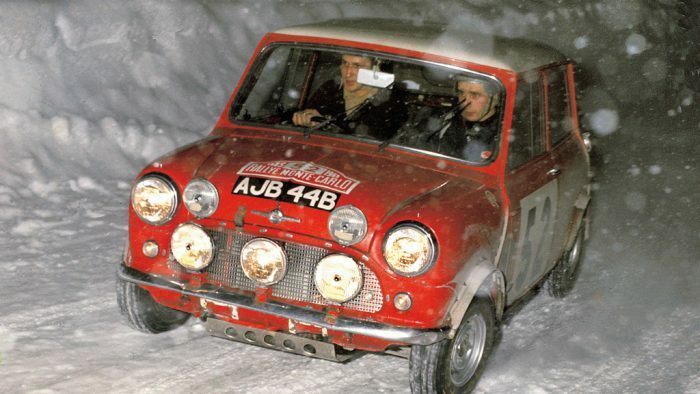 But Paddy Hopkirk didn’t give the Mini Cooper a rest, finishing only half a minute behind Ljungfeldt and thus clinching victory in the 1964 Monte Carlo Rally. So at the end of the race Paddy Hopkirk was the winner with 2,536.2 points, Bo Ljungfeldt finished second with 2,566.7 points, and Carlsson was third with 2,573.7 points. To round off the Mini Coopers’ triumphant appearance, Makinen finished fourth with 2,593.8 points. The works strategy had proven successful in every respect. The weather conditions in 1965 were acknowledged as some of the most difficult ever. And instead of the final circuit race on the Formula 1 track to Monaco, the teams now had to go back to the mountains a second time. 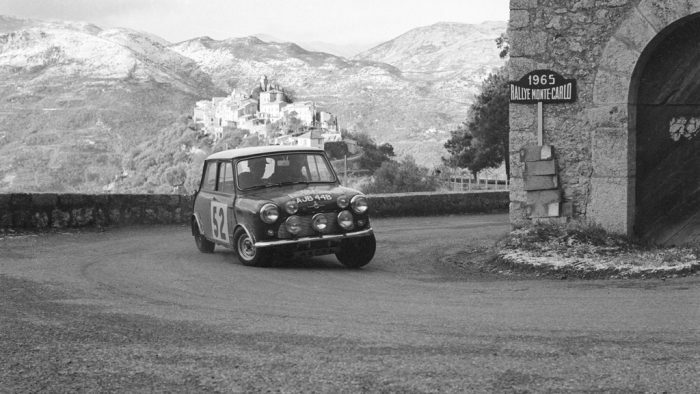 Rally cars were required to cover 378 miles (610 km) in a second tormenting night drive from Saint Claude to Monte Carlo, again racing through the Alpes Maritimes under the toughest conditions. Visibility in dense snowfall was almost zero and the drivers were dazzled by their halogen headlights reflected by the snow and ice. Ultimately only 35 out of the original 237 teams saw the finish. 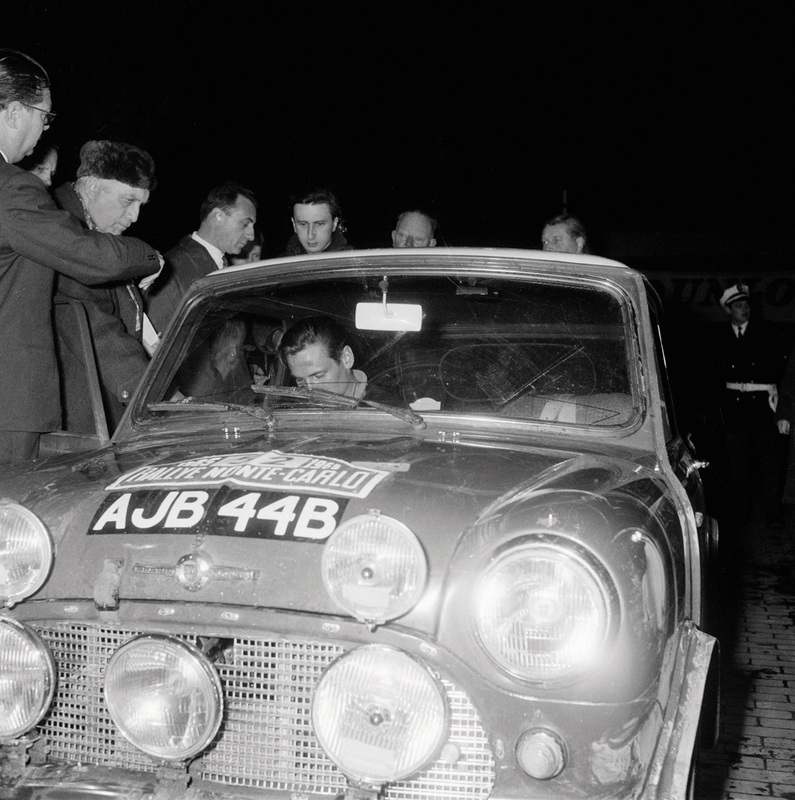 Facing this kind of challenge, Makinen put up an amazing performance in his Cooper S, achieving the fastest time in three out of five special trials on the last, ultra-difficult legs of the race. Entering the last night, eight minutes in the lead, Makinen won no less than five out of six special trials, to take the overall victory at in 1965. 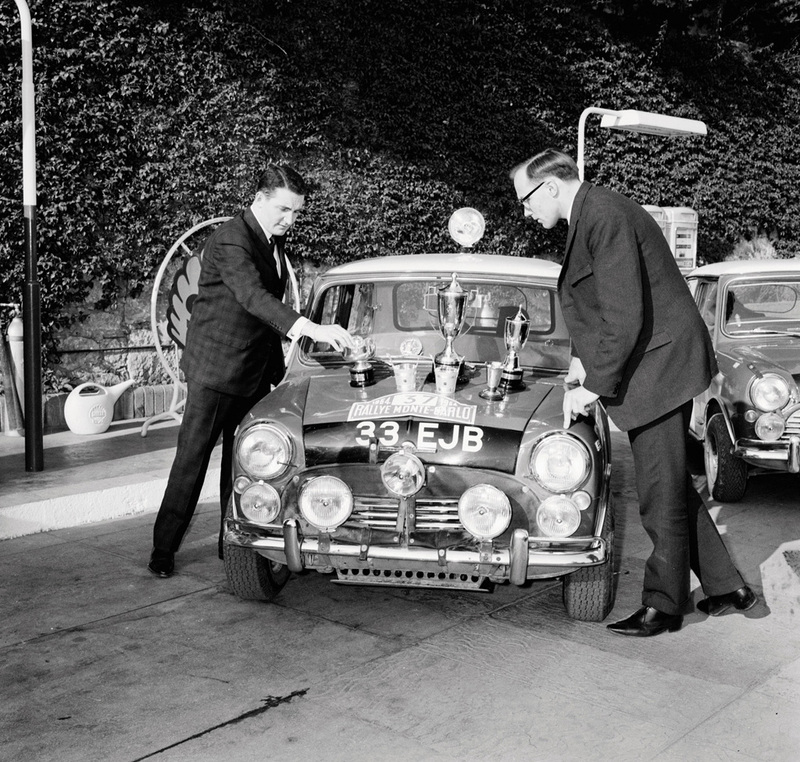 In 1966, Mini went for their hat trick, the four Cooper teams being acknowledged as the favourites in the race and receiving lots of public interest. From the start, the teams lived up to this commitment, Makinen, Aaltonen and Hopkirk left all the others far behind and finishing first, second and third at the end of the Rally. But then came one of the most questionable decisions in the history of the Monte Carlo Rally. The race commissioners demanded an eight hour technical inspection after the event. As a result, the four additional headlights mounted on the radiator grille of the Mini Coopers were found to fail with French homologation rules. And proceeding from this highly debatable point, the jury disqualified the first three cars. With the Lotus Cortina finishing fourth, and being disqualified for the same reason, Citroen driver Toivonen moved up to the top of the podium as the winner. 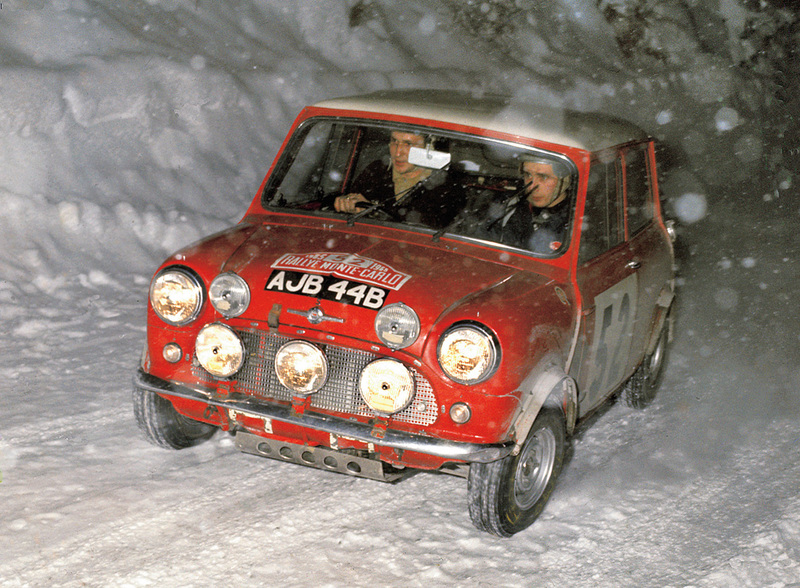 It certainly was the sensation in the 1963/64 winter rally season: A small red Mini with a white roof proudly showed its tailpipe to all the larger entrants, clinching overall victory in the Monte Carlo Rally, and then repeated the task in 65 and 65. 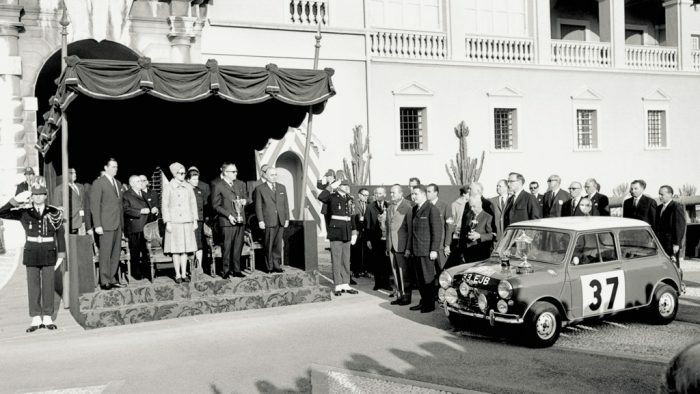 The tiny little car immediately became a legend: Originally conceived as an inexpensive and economical means of transport, the Mini had been transformed into the Mini Cooper S. There was still no other car in the market able to offer the same kind of sporting performance for so little money. This is one of the most correctly specified and detailed ex-works Minis around. Since completion in 1998 the car has been maintained regardless of cost (as confirmed by bills on file) and always garaged in a heated and dehumidified motor house. Apart from regular exercise on various historic rally ‘fun runs’ as part of the ‘Slowly Sideways Group’, ‘DJB 93B’ has also been successfully hill climbed and sprinted with a win in the 2001 Midland Speed Classic Championship. The car purchased at Bonhams’ ‘Race Retro’ sale at Stoneleigh, Warwickshire in March 2007 (Lot 306), since when it has been invited to the Goodwood ‘Festival of Speed’ where it was driven again by Rauno Aaltonen in 2010. While other ex-works cars come onto the open market from time to time, many of them are likely to cost very much more again to restore and then involve even further expenditure to return them to period-correct specification. Few are likely to have been prepared to the standard of authenticity to be found on this car. 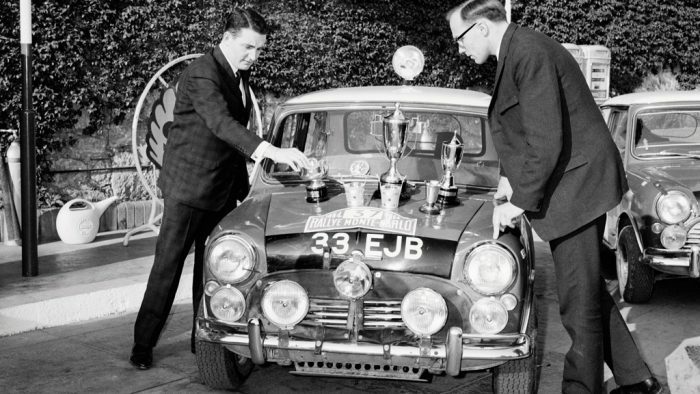 ‘DJB 93B’ has been rebuilt as far as has been practical to the original specification in which it would have started the 1965 RAC Rally, which it won, making it the only Mini ever to do so.